The beach of Plakes on the island of Alonissos in Greece, information and pictures. This beach is mostly flat rocks which are good for sun bathing and it has just a small shingle beach area as well. Plakes beach is situated in the southeast of the island of Alonissos in between Marpounta Beach and the harbour of Patitiri. You can walk to the beach from Patitiri. The distance to the harbour is approximately 1 kilometre. For a description of the route click here. 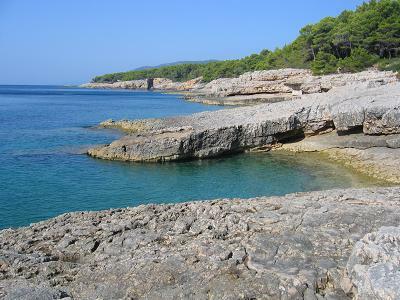 There is a camping site near the beach (at 50 metres distance, it is called "Camping Rocks"). The tents here are placed in the shade under the trees. I don't have any more information on this beach. There are no facilities here (no taverna, no sunbeds, no umbrellas and no accommodations but the camping, for as far as I know, but pherhaps there are some facilities that go with the camping...as I understand there is a small café and there are toilets here...). If you want to spend time on Plakes beach bring your own water supply and something to eat.